Matt Smith '02 (international business & management, religion) has been busy since graduating back in 2002. The Army lieutenant colonel earned an MBA from Walden University and an MMS at the U.S. Army's School of Advanced Military Studies. He’s learned to fly a helicopter, accumulating more than 1,000 flight hours and flew rescue and relief operations in New Orleans following Hurricane Katrina. He’s also worked with the U.S Department of State, served as a speechwriter for a commanding general and worked with the Iraqi Army. Now—after living everywhere from Texas, Kansas, Alabama, Hawaii and Pennsylvania to Korea and Iraq—Smith has returned to Carlisle with his wife, Ashley, and their three kids, as chair of Dickinson’s Department of Military Science (ROTC) and professor of military science. What excites you about leading the Blue Mountain Battalion of ROTC? My family and I are excited about serving at Dickinson and the Carlisle community. It’s humbling to return to Dickinson and to have the opportunity to give back to its ROTC program and the college. Leading the Blue Mountain Battalion gives me the opportunity to shape and influence how young men and women will lead and care for soldiers and their families. I work with a tremendous cadre who are passionate military and civilian leaders, so there are no bad days in the Blue Mountain Battalion. What does a liberal-arts college offer the ROTC cadet in terms of preparation for a future as an officer? A liberal-arts education provides a student with a rich, and varied, tapestry of ideas, knowledge and insight to draw from to face life’s adventures. A liberal-arts education should challenge one’s dispositions, while refining one’s convictions. 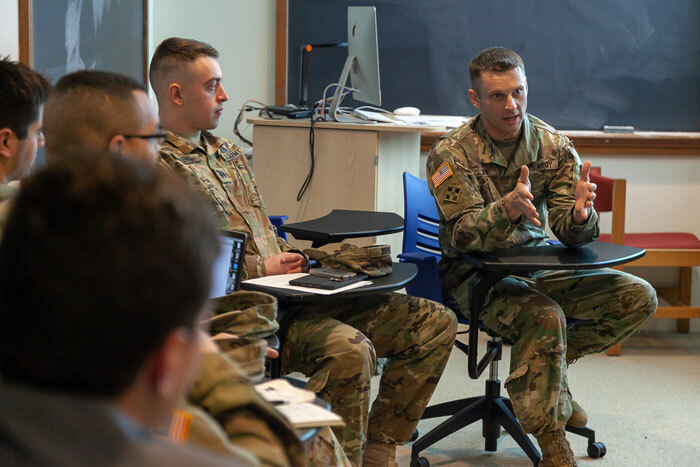 In today’s military climate, Army officers must be ready to travel abroad and engage with people of various cultures, traditions and belief systems. A liberal-arts institution like Dickinson provides a firm foundation and the necessary building material (attitude, worldview, mental agility) to achieve success in those “foreign” situations. Anecdotally, during my second tour in Iraq, I unexpectedly shifted duties from leading a platoon of soldiers at a remote, rural base to working with the U.S. Department of State and the Iraqi government in the Green Zone (in the heart of Baghdad). It was a total culture shock. One day I found myself sipping tea with one of the directors of the fledgling Iraqi government, and he was asking for my help and advice. Up to this point, the Army had only trained me to fly helicopters and lead soldiers. Thus, I fell back on aspects of my liberal-arts education—listen, seek context, respect, learn—to help me navigate the uncertain waters of that day and the many associated with that deployment. How did you get interested in a military career, and what about it do you enjoy most? Though my dad had served in the Army, I had intended to pursue a nonmilitary career. However, I enrolled in ROTC at Dickinson my first year. I enjoyed the program, the training it provided and the people I found myself surrounded by. I applied for a scholarship as a sophomore and, well, the rest is ongoing history. As to what I have enjoyed most, it would be the people. I have had great and terrible jobs. I’ve worked at great and terrible places. But in all, and through all, the various circumstances working with and building up my fellow soldiers has been my constant source of enthusiasm and passion. I enjoy celebrating the successes of others. At our first battalion-level meeting with all the cadets, I shared the following quote from the Hermann Hesse book Journey to the East: “He must appear, I must disappear.” It sums up the desired progression and end state for my time at Dickinson. I’m in the twilight of my military service. My glory will be in seeing the young men and women become servant-leaders of character, strength and compassion. What comes to mind as something unforgettable that you’ve done since you graduated from Dickinson? With the meritocracy of the military profession and the frenetic pace of a “connected” life, it’s easy for one to lose his or her way while chasing the next assignment or promotion or accolade or “like.” I did, and I found myself exhausted mentally, emotionally, spiritually and physically. Then, about five years ago, I committed to seeking God first in my life. I shifted from yearning after my own praise to acting, speaking and reacting through the lens of glorifying God. In doing so, I steadied my life’s course. I still have off days and tension still arises between competing “priorities,” but with my identity in Christ, I know the way. Smith Matt (left) and Ted Pulcini, Dickinson's Thomas Bowman Professor of Religion and Philosophy, reunited in 2018 in Britton Plaza for lunch. Smith recalls a favorite Dickinson memory: "Falling asleep on Professor Pulcini’s shoulder during class. To this day, he still jabs me about it."